Roma Gallery is pleased to open for the first time with historic artworks by the artist Pavlos (Dionyssopoulos). Pavlos is known both in Greece and overseas for his unique manner of creating art without the boundaries of traditional tools like canvas and paintbrushes but rather with a humble medium, poster paper, that is manipulated into stunningly beautiful, masterful artworks. Pavlos was born in Greece in 1930 but after studying at the Athens School of Fine Arts with his teacher Yiannis Moralis he left for his studies in France with a scholarship from the French state. He returned to Athens in 1955 and worked in advertising and theater until 1958 until he left for Paris again. Living in Paris in the 1960’s, he was influenced by the movements of the “New Realists” and the “Affichistes” however he maintained his own stance and never fully joined in these groups. One of the most significant people he came into contact with in Paris was the famed art critic Pierre Restany who admired his work and noted the interesting switch that Pavlos made from conventional canvas to the use of a cheap, everyday material from the modern world. This use of the simple poster shredded into strips became his primary medium. He used this paper cut into fine strips with a machine, (affiches massicotees) and manipulated the strips into swirling, colored surfaces where colors and forms unite. Certain of these types of works were started in the 1960’s and the manner in which the paper strips bend and curve in a voluptuous manner dubbed them “Baroque” style. In later years, this medium was used to make figurative images and objects into three-dimensional creations that create a sort of visual illusion. Sometimes he used other materials such as steel wool or ribbons named “bolduc” ribbons and these were transformed into his three dimensional creations. Pavlos maintains that posters, displayed cut up and in profile, are particularly expressive. 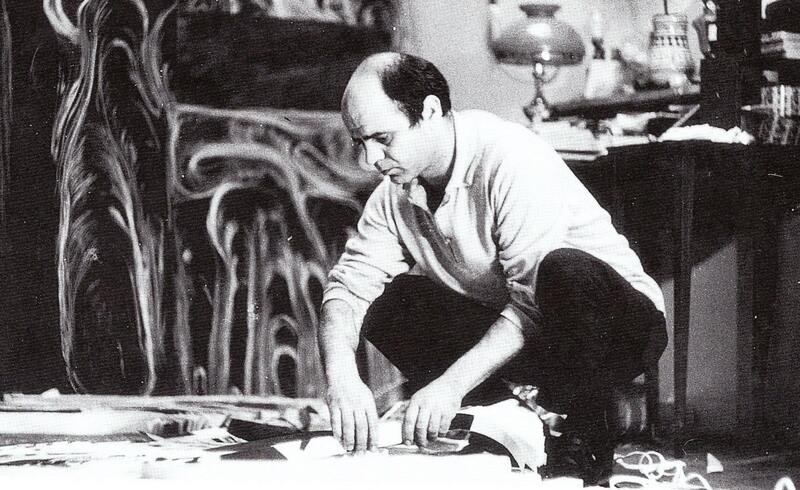 His friendships with artists in Paris at the time such as Calder, Giacometti and Dubuffet inspired him however he continued to evolve his own particular expression of space, color and texture. Pavlos is considered one of the most important living Greek artists today with a long history of accomplishments. Pavlos has worked with major European galleries (Sonnabend, Iolas, etc.) since his first solo exhibition at Galerie J in Paris in 1964. In 1980 he represented Greece in the Venice Biennale. 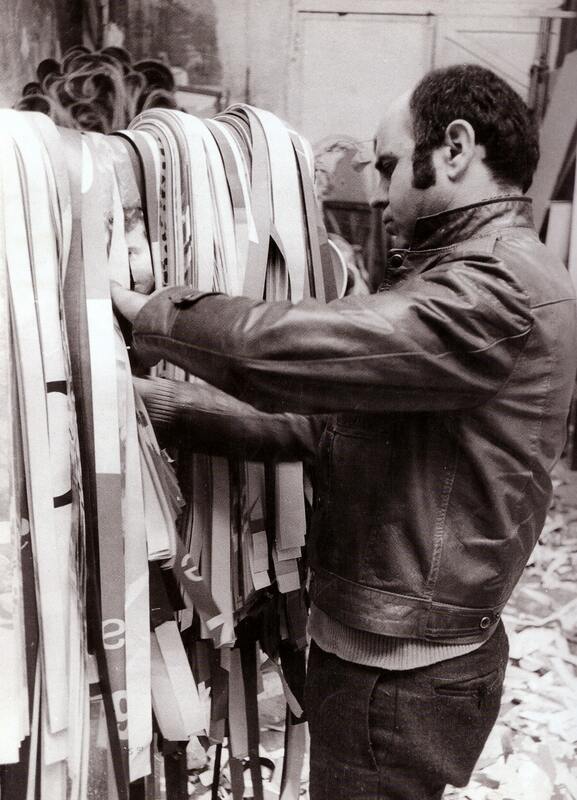 In 1985, Pavlos presented a historic exhibition of flags from various countries in the European Union, in 1992 the City of Paris organized a retrospective of his works at the Sorbonne, in 1997 the Costopoulos Foundation presented a large exhibition in Athens. Pavlos’ works are also part of museum collections such as the Museum of Modern Art in New York, the Musee d’art Moderne de la Ville de Paris, the Centre Pompidou in Paris, the European Parliament in Brussels, the National Gallery of Athens and many more. His works also belong to many prominent private collections from around the world. Pavlos offers viewers many types of everyday objects that are rendered in his particular way. His works evolve from depictions of consumer goods, environmental imagery like, grass or the sea to still-life objects with titles such as coat, hat, fruit, bowl etc. Eventually, he even produces a series of works depicting Superheros like Batman and Spiderman, which make reference to the manner in which viewers like to mythologize what they see. In 2013, the Galerie Strouk in Paris presented an exhibition purely devoted to the Superheros called “les SUPER ”. Pavlos makes these everyday objects appear poetic by forming intricate combinations of paper with rich and varied color combinations. One might say, like a type of music of his own he “composes” these gem-like works for us. 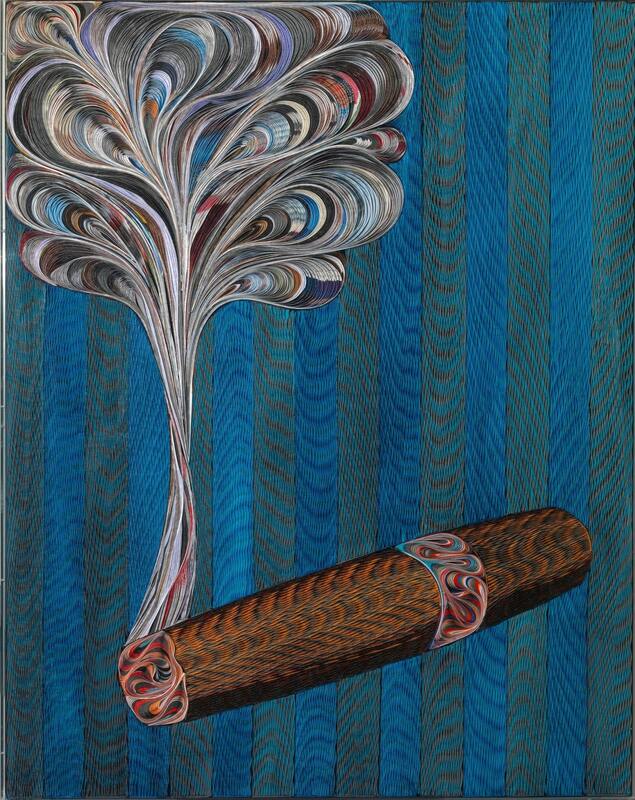 Pavlos, Cigar, poster paper, 150x120x7 cm. 2007. Roma Gallery opens for the first time in Athens with some of Pavlos’ most esteemed works. Gallery owner, Anna Angelopoulou and her Associate Directors, Joanna Papadopoulou Averoff and Iridanos Tsiringoulis are pleased to host this exhibition until the 10th of March offering people the chance to see these outstanding and rare artworks by one of the country’s most recognized artists. Roma Gallery is a new art gallery which plans to incorporate the owner’s many years as a collector and art advisor with a platform in the gallery whereby many of the most significant Greek artists will be exhibited. As well as Greek artists, Roma Gallery plans to show works by foreign artists as well but first and foremost, to selectively showcase the most esteemed and established artists. The gallery is determined to provide its collectors and with exceptional works by artists they know but also to introduce them to new, carefully chosen works. In a period where Athens is still struggling to recover from a long, drawn-out period of crisis, the gallery hopes to inspire those who visit it both with the art and through its choices of what to exhibit which will be solidly chosen and esteemed to stand the test of time. Roma Gallery is pleased to announce its opening with the work of Pavlos on Thursday, January10th at 7 pm. 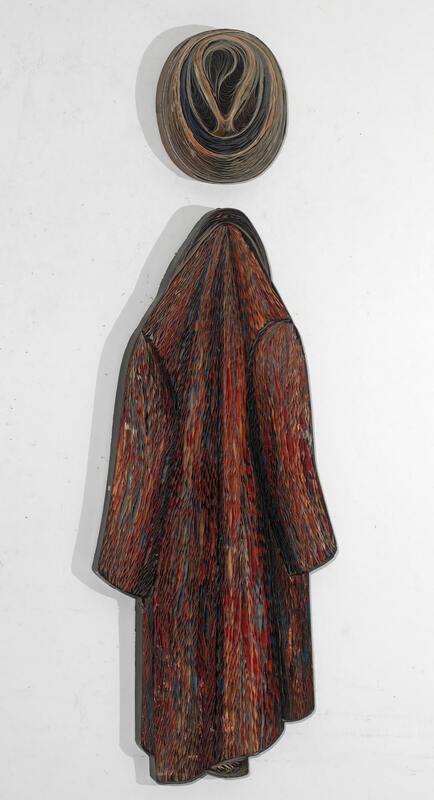 Pavlos, Coat and Hat, poster paper, 120x50 cm. (Hat) 31x62 cm. 1966.